Sitting and painting by this stream was very relaxing. I like how the painting turned out but it may be a little misleading. It is just off of a road and while the sound of the creek drowned out the sound of the passing cars. I was pretty aware that I wasn't far off of the beaten path. That is one of the great things about making art. You can highlight the good and show only the parts of scene that speak to you. I was itching to try a new hiking stool that I had purchased and I drove around for a while before picking this spot. This stream was near a road I travel quite often. I often had thought it was a pretty place but never really stopped to enjoy it due to the absence of a place to park and ultimately the lack of a companion trail to hike along. In other words, it was a nice spot but it was only a spot. Not an adventure. But for some reason, the stool changed my mindset. I wasn't going on a hike, I was going to go on a "sit". Sometimes we just need a little prompt to see things differently. The stool and the desire to paint did that for me this time. Since I was pretty close to the road, I did get a few curious looks as to what I was doing but I didn't mind. Once I got immersed in creating time really sped by and I only quit because it became too dark to see any contrast. I finished up the painting once I got home to add a bit more pop then you tend to see while in the field. 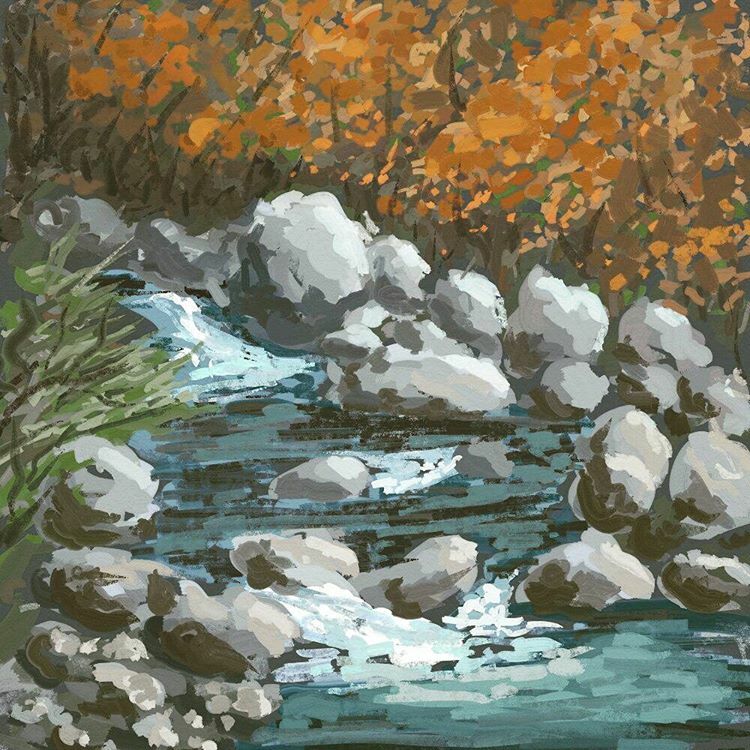 Painted on a Samsung Note 3 smartphone using Artrage for Android.